Neidpath Cottage is adjacent to the castle and overlooks the River Tweed. Peebles has many shops and restaurants and you can enjoy outdoor activities arranged locally whether your stay is for a weekend short break or longer. There is no finer location than the Tweed Valley from which to explore the famous unspoilt Scottish Borders countryside. For the walker there are rolling hills, extensive mature forests, superb river valleys and interesting towns and villages. 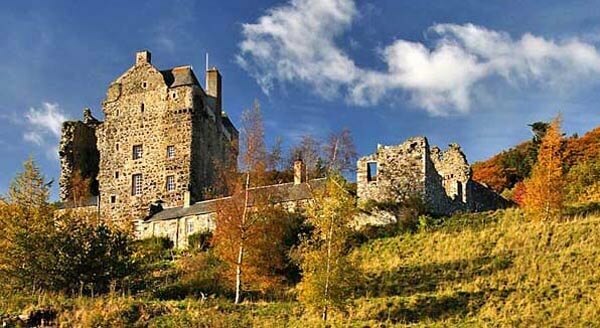 The town of Peebles is just half a mile away from Neidpath Castle Cottage. There are lots of shopping opportunities here from gorgeous gift ideas, divine shoe shops and lots of outdoor clothing. There is an abundance of coffee shops and great places to eat. Peebles is also an ideal base for not only visiting the Border towns but for Edinburgh too. The capital is just forty five minutes away for sightseeing, shopping, visiting galleries, museums and theatres and the Edinburgh Festival. Peebles is now the centre of the mountain biking world, with Glentress, Innerleithen Downhill and 7Stanes all nearby. Fishing on the River Tweed is available within walking distance. For garden lovers, Kailzie and Dawyck with its glorious trees are a few miles away. John Buchan fans can walk through his beautifully described landscape all around. Kayaking, archery, quad-biking, horse riding and falconry are among the many activities that can be arranged. Neidpath Cottage is adjacent to the castle and overlooks the River Tweed below. It was once used as the kitchens for the castle after Cromwell destroyed the original one. There is a lovely light-filled sitting room with an open log fire, from where you enter the master bedroom, with ensuite shower room, and the single bedroom. The kitchen is large enough to sit in with a fully equipped work area including a 5 hob gas cooker with a large electric oven and plenty of crockery and utensils. 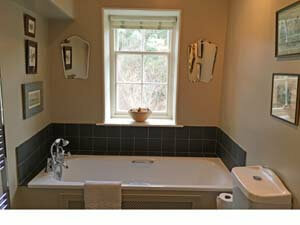 The family bathroom has a full sized bath for soaking in with a hand shower attachment, and is in the centre of the cottage. 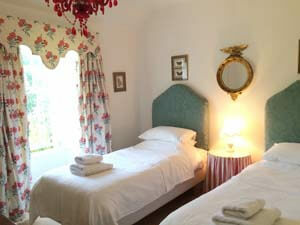 The twin bedroom has a pretty red glass chandelier and is at the far end of the cottage. There is a small cloakroom by the front door, and a utility area with a washing machine and dryer. 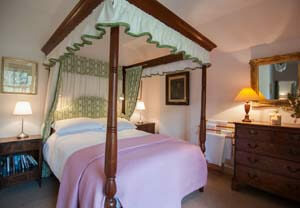 All the rooms are decorated in a charming traditional way, with proper curtains and shutters throughout. From Edinburgh, take the A703 to Peebles. Go through Peebles and out towards Glasgow. Neidpath is 1/2 mile beyond the town on the left. From Moffat (A74M), take the A702 to Peebles, turn right onto the A72 just before Broughton, signposted to Peebles. Go through Drumezlier and Stobo. Turn right at T junction to Peebles. Neidpath Castle is 3 miles further, on the right, just before Peebles. 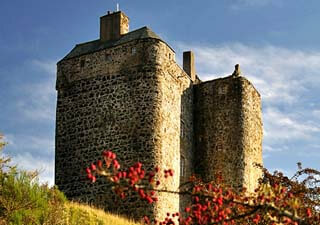 Neidpath Castle Cottage is rented out throughout the year. Change over day is Friday - check out 10am, check in 4pm. Very convenient to rent if you wish to hold a party at the castle. Disabled access - all accommodation on one floor. To book this unique holiday cottage next to a castle near Peebles, click the enquiry button below and see availability and rental rates. 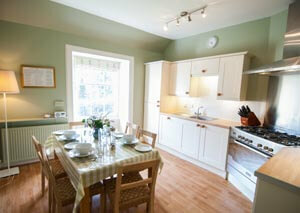 The situation of this cottage is amazing, overlooking the River Tweed so ideal for a fishing holiday. There is so much to do in the area - it's the centre of the mountain biking world but there are lots of gentler activities nearby. 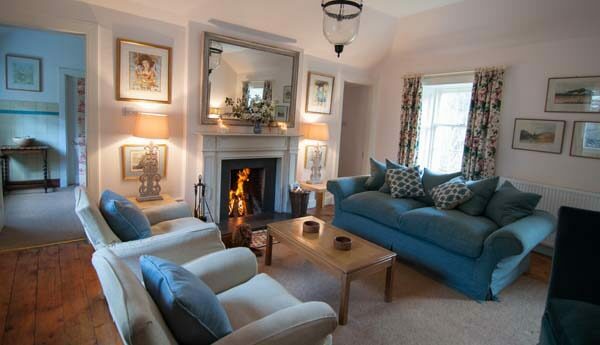 Beautifully decorated and with a log fire to relax in front of this is a really special cottage!